There’s nothing quite like the thrill of finding your forever home, the place where you can settle in for a good long stretch and then watch delightedly as the grandkids gather in the rooms that have shaped your life. But sometimes, even a dream home needs a wake-up call. And for one Lake Forest couple, giving a much-loved house an update has made all the difference. “This was something my clients had been thinking of doing for some time, and once they were really ready to transform their home, we kicked things off by assembling a great team,” relates Jessica Margot Federighi of Jessica Margot Design. The project—which Federighi executed with Master Design Build Group and Delleman & Co.—involved re-imagining the home’s primary gathering spaces: kitchen, family room, living room, and dining room. Federighi’s scheme called for improving the function of the existing spaces while fashioning a more pleasing, contemporary appearance. “We started by assessing the clients’ needs, moved forward with space planning, then expanded upon that with a layering of sophisticated details that elevated the space and enhanced how family and friends used and enjoyed the home,” says Federighi. 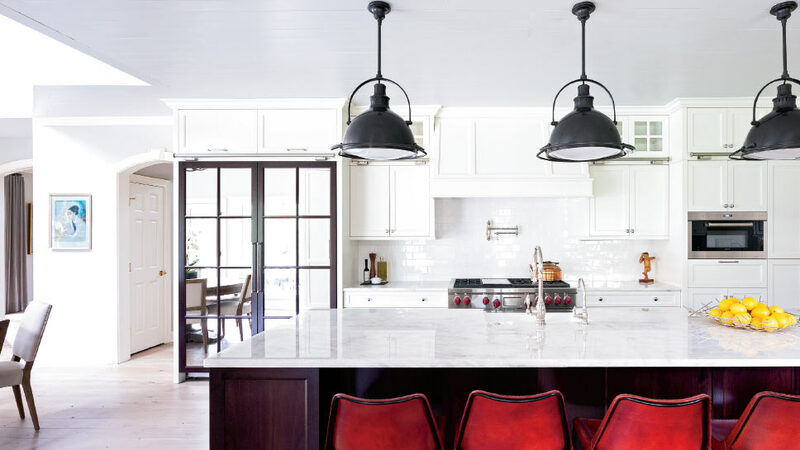 In the custom kitchen, she unified the dual level flooring to create a more cohesive space and pumped up the prep area with a commodious new island. Mullioned mirrors minimize the visual bulk of the refrigerator and enhanced task lighting not only makes cooking chores easier, but adds depth to the physical play of top of the line millwork, Iceberg Extra Quartzite countertops, and appliances. The new cabinetry is topped by glass-fronted cupboards that are easily accessed by a rolling ladder. “My client didn’t want to bother getting out a step stool to reach those spaces, so we ran a ladder rail across the entire kitchen,” explains Federighi. When not in use, the simple white ladder has its own exposed docking station, where it adds an unexpected visual punch to the room. 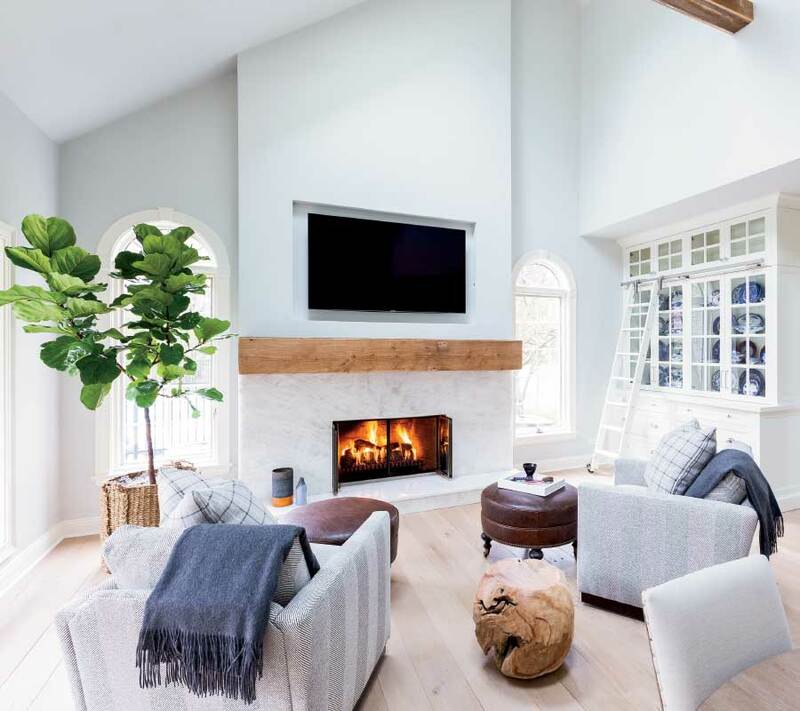 Natural light flooding through newly-added windows and French doors combines with Federighi’s neutral palette—lightly-hued French oak flooring, pale gray and off-white walls—to generate a clean, bright ambiance. Shiplap on the ceiling and a reclaimed wood beam spanning the double-height family room (where easy chairs and ottomans cozy up to a clean-lined hearth) give the welcoming space a modern farmhouse feel. Federighi’s strategy for making the home function at a higher level included flipping the living and dining rooms. The existing dining room was too small to comfortably accommodate large family gatherings, and with the expansive kitchen and family room offering a magnetic hub for get-togethers, she re-thought the living room as a more intimate, den-like space. 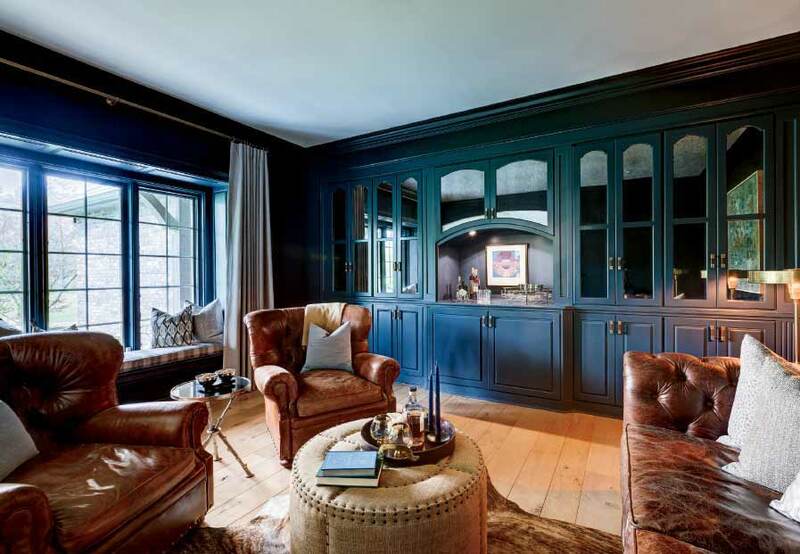 Although these rooms are now dramatically different, here—as in most successful designs—a sense of continuity is key. A treasured collection of blue and white china is displayed in a glass-fronted cabinet in the family room and a set of barstools—upholstered in an eye-engaging saddle leather with metal legs —belly up to the island in the kitchen. Someday, those grandkids will look back and relish their own memories of their time here, rolling that ladder through the kitchen, perhaps, or snuggling up in front of the fire while the grown-ups fussed over dinner or set the table. Now, that’s food for thought. Designer Assistant Elizabeth DeBonis; John Masterson of Master Design Build Group; Dan Delleman of Delleman & Co.; Lisa Kinzelberg Art; Jen Olson of Urban Workroom; Ellie Nottoli of Ellie Styled; VIP Stone & Tile; Seasons 440; Jayson Home; Circa Lighting; Lightology; Studio 41; and Banner Plumbing. For more information, visit jessicamargot.com.